Our primary focus in Friday morning’s premarket report was the SPY, for which we had signaled and tracked a range of calls the previous day. Our initial targets were the SPY Weekly $270-272 Calls. and Friday we expanded that range to include the SPY Weekly $272.50-274 Calls. After another bullish session for the SPY on Friday, we’ve got updates to the highs and overall possible gains on our original contracts, as well as the maximum intraday profits that could have been seized with our rolled up strike prices. All in all, we ended up with two incredible sets of one and two-day runners without a single dud in the bunch! Catching our eye as a potential bottom-bounceplay this morning is DCAR, which, prior to today, has already begun to come up off of recently registered lows on Friday. As you can see on the included chart, our favorite indicators are clearly pointing up, with a MACD cross underway and a rapidly strengthening RSI. This morning, a new catalyst has entered into the mix, with the company reporting a new agreement with Jaguar/Land Rover Manhattan. The dealership will use DropCar’s Enterprise Vehicle Assistance & Logistics technology platform to automate the pickup and delivery of customer vehicles for service and maintenance. 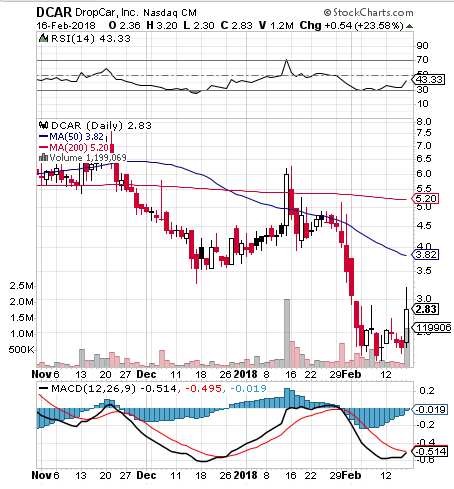 Despite gapping up moderately in the premarket, is still a fair bit of unrealized upside potential, so we’ll add DCAR to our radars and keep a close watch over it in coming sessions. After reporting positive cancer trial results on Friday, we talked about MRTX being poised for a big move and we weren’t incorrect. The stock exploded out of the gate right from the outset, and traded in an impressive range from 9.15 to 12.40 early on in the day. That was good for a 35% intraday run- excellent for a $9+ stock. This is the third time in as many weeks we’ve called a stock that was approaching the ten dollar range and saw it gain more than a third in value in a single session. Not only did MRTX trade up big on many times more thanits average volume, but it managed to maintain well over half of its daily advance, so we’ll be interested to continue monitoring its activity as we kick off a fresh trading week. We want to place ICNB on bottom-watch after taking a look at the recent history of the chart. This stock exhibits some really nice volatility and is coming down off of a significant spike. When it finds support and rebounds, we could see a notable swing trade opportunity. The last such swing took the stock from the .003 range to .014. The company recently announced its brand of Prosecco endorsed by former supermodel Christie Brinkley would be carried by Publix stores, so we’ll also be looking for further updates on that part of the story as well. We tagged PSTI for observation roughly a month ago, and have since seen a moderate move up on the chart, and will want to continue monitoring the situation. The run the stock has made thus far is a marginal 27%, but things this morning have taken an interesting turn as the company announced the FDA granted fast track status to one of its treatments.